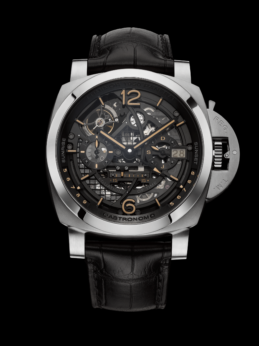 If you haven’t figured it out already, the name of Panerai’s first-ever moonphase watch says it all — except for the complexity of building it. The L’Astronomo Luminor 1950 Tourbillon Moon Phases Equation of Time GMT watch will be built on a made-to-order basis, allowing its master watchmakers to personalize the geographic coordinates selected by the buyer. 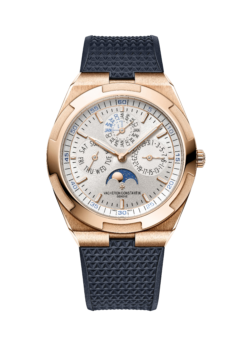 The watch pays homage to Galileo’s astronomical studies, is crafted of brushed titanium with a sapphire caseback, has a moonphase indication and an innovative, patent-pending system indicating the date that uses polarized crystals. Even though each date is inscribed in the crystal, the numbers are virtually invisible except when aligned with the date window. The watch can be customized upon ordering, with a choice of case metals, finish, hand colors, Super-LumiNova color and whichever geographic coordinates are closest to your heart, allowing you to take a piece of home with you.